Fall is here, and that means its homecoming season. The title of homecoming queen and king are bestowed upon the school's most popular and respected students. And students at South Effingham High School have overwhelmingly chosen one young man as their homecoming king. Senior Michael Holton will tell you he is just like everyone else. He enjoys sports and music, and just like all teenage boys, he enjoys the company of his female friends. There is something that makes him different, but his friends say they wouldn't want him to change one bit. Here at South Effingham High, Michael Holton is known as the big guy on campus. "Every time I see him walking down the hall, everyone is giving him high fives,” says Senior Tyler Sheppard. So naturally, when it came time to vote for homecoming court his friend Kaite White knew there was only one guy worthy of being king. "I was like, 'Ya’ll need to go and vote for Mikey, don't forget,’ and everyone had already gone and done it. Everyone knew and wanted Mikey to win." Mikey has Down Syndrome, but his friends say they don't see his disability. Amy Jameson just sees someone she admires. "He never lets anything bring him down. No matter if he fails and fails, he is going to keep trying, and that encourages all of us to never give up and take his spirit, and it rubs off on a lot of our peers as well as ourselves." 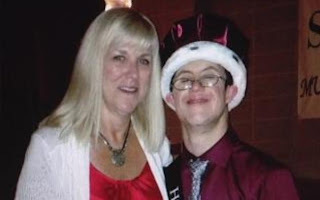 On Saturday, Mikey received his crown after capturing the hearts and votes of 97 percent of his school. Assistant Principal Jeff Faith says its not just a testament to Mikey, but the entire student body. "They are very caring and compassionate, but more than anything else, they just accept Mikey as one of the regular students." For mom, Amy Holton, it’s just another way Mikey continues to defy the odds. "Michael has just always surprised us. We’ve always pushed him to do different things and exposed him to different things. Don’t limit your children, whether they have a disability or don't have a disability." Mikey can add homecoming king to his long list of accomplishments. He has also earned five gold medals in the Equestrian Special Olympics and a second degree blue belt in Tae Kwon Do. To learn more about Mikey, pick up last month's issue of Effingham Magazine.